Rt Rev Robert Innes, Bishop of Gibraltar in Europe. are interested in being prepared for Confirmation. In Confirmation Preparation we look through the Catechism in the Book of Common Prayer. 1 7:30pm Thursday 28 February: What is Confirmation? People are welcome to attend to learn about the faith without necessarily committing to confirmation. All questions are most welcome! There is an expectation that candidates will attend church on Sundays in preparation. Confirmation is derived from the Latin word confirmare, which means “to strengthen.” Confirmation includes a public profession of the faith which, for those baptised as infants, was confessed by parents and God-parents at baptism. It is also a means of grace, a sacramental gift where the bishop prays while laying hands on each confirmand that he or she may be confirmed or strengthened by the gift of the Holy Spirit. The Anglican Church administers confirmation in response to the example of the Apostles laying their hands on disciples of Christ and praying for the gift of the Spirit (Acts 8.14-17) and New Testament teaching about the sealing or anointing of the Holy Spirit (Heb. 6:2, Eph. 1:13,14, 2 Cor. 1:21). 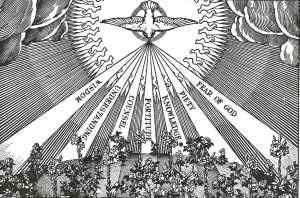 The gifts of the Holy Spirit in Confirmation mark that point in our Christian life when we are prepared to make for ourselves the solemn profession of faith and ‘other centredness’ which others made for us at our baptism. Confirmation takes place with the “laying on of hands” by the Bishop. 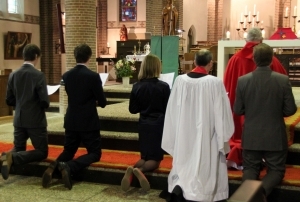 Confirmation is traditionally thought to be the completion of the rite of Christian initiation and thus an appropriate preparation before receiving Holy Communion. On the day that we now celebrate as the feast of Pentecost, Jesus’ disciples had gathered in a room, anxious and fearful, unable to make meaning of the suffering and death of their Lord. The Holy Spirit came to them, changing them from ordinary people who loved God to people who would bring His message of hope and love to a disbelieving world. In Confirmation, that same Spirit enters our lives in this active way. We commit ourselves to a growing, deepening relationship with God, and to the responsibilities that go with it. Young people should be of an age when they can ponder serious questions about God and the church. They must be willing and able to think about the Holy Communion, not to understand it, but to accept that it is a mystery. For many young people, an age between 11 and 14 often seems right. Others ask to be confirmed as adults, finding in the preparation and the solemn service a time to make a conscious response to God’s calling and gifts. Many have been baptized as infants, but found it takes years to really feel faith “on the inside” and desire Confirmation. Preparing for Confirmation is an opportunity for questioning and learning. No aspect of the faith is “off-limits” to your sincere and honest enquiry as you prepare for Confirmation. The Chaplain, or fellow Christians who travel the same road, have the same needs and questions as you, will listen and teach as you prepare for Confirmation. Expect to spend some time each week for six to eight weeks as preparation, in a small group or one-on-one. 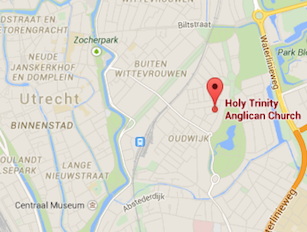 Confirmation by the Bishop normally takes place at Holy Trinity in the Spring. If you are interested in confirmation for yourself or for your son or daughter, please contact our chaplain who would be most pleased to speak with you.